The Canadian Library and Archives website hosts a section called “Backcheck: A hockey retrospective.” Roch Carrier introduces the archive with the following words: “Hockey is also the history of Canadians. The game reflects the reality of Canada in its evolution, ambitions, character, tensions and partnerships.” In this archive, we can learn about the beginnings of hockey equipment, French-Canadian hockey, Aboriginal hockey, women’s hockey, and read about great hockey stories. What you won’t find on this hockey retrospective is the history of Black Canadian contributions to the game. 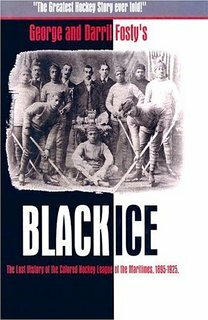 I recently read George and Daryl Fosty’s book, Black Ice: The last history of the Colored Hockey League of the Maritimes, 1895-1925, and feel like it is a necessary read for all Canadians and any hockey fan. Out of the sixteen chapters, it seems that only about half are really hockey centred, which makes it equal parts history and sports book. I, probably like many Canadians/hockey fans, had assumed that the game of hockey had been created by white males for white males. This assumption would be wrong. For example, did you know that there were two original sets of rules for hockey in Canada – the “Montreal Rules” and the “Halifax Rules.” The Montreal Rules treated hockey very much like rugby in that forward passing was not allowed. The Hailfax rules, largely influenced by the Coloured League, were much more akin to the fast moving hockey we have become accustomed to. The Coloured League was also the first that allowed the goalies to cover the puck by dropping to the ice and to play the puck outside the crease. These developments that we take for granted as simply “part of the game” today are the legacy of a League and players that have received little recognition in the game’s overall history. Today there are no monuments to the Colored Hockey League of the Maritimes and few hockey books even recognize the league. Names of hockey pioneers like Henry Slyvester Williams, James Johnston, James Kinney or the scores of players who wore the Colored League uniforms are nowhere to be found. There is no mention in the Hockey Hall of Fame of the impact that Blacks had in the development of the modern game of hockey. There are no references to the Black origin of the slap shot or the innovative style of the goal play exhibited by Franklyn. There is no reference to the Black origin of goalies going down on ice in order to stop the puck. It is as if the league had never existed…. The fact that these men and their contributions have been erased from Canada’s national winter past time is not only a great loss for the hockey community but also for the nation as a whole. The Fosty’s argue that “Hockey permeates all levels of Canadian society, impacting on social status, ethical values, language, hero worship, and race. It is a record of who Canadians are, what they aspire to, and what they have achieved” (p.221). Thus, it would seem that our record is incomplete. I mean, there are numerous books, a classic film, and memorabilia about the All-American Girls Professional Baseball League in the Smithsonian, all as part of baseball’s history and the role that women played during World War II. And, I think many of us can agree that, the world at large continues to question the value of women on a daily basis. Therefore, the fact that a player such as Herb Carnegie, has still not (and may never be) memorialized by the Hockey Hall of Fame illustrates how far we are from achieving equal rights for all, and the desperate need for the #BlackLivesMatter movement. For if a black man, who was arguably as good as or better than the likes of Jean Beliveau, cannot be included in the history of hockey in the year 2015 what kind of progress have we really made? Some may argue that Carnegie never played in the NHL but the Hockey Hall of Fame opened its doors to women in 2009 and none of them (except for Manon Rheaume) have played in the NHL. In other words, instead of talking about access and participation, we are talking about the ability to create. The goal of cultural citizenship is to produce a national narrative that is no longer based on a single linear history. This is what makes voices of colour imperative in the world of hockey (and elsewhere) because they add context and movement to the story of hockey. 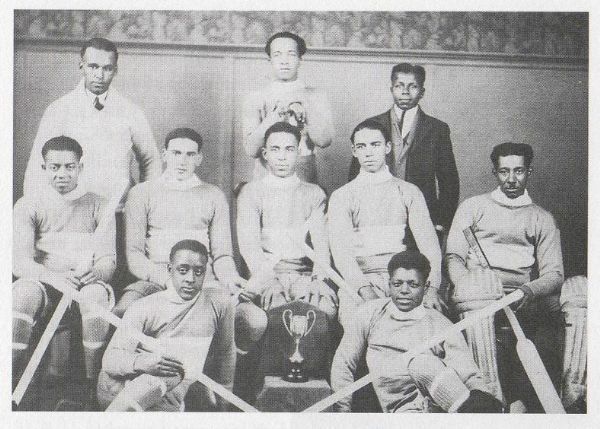 The Fosty’s argue that the Coloured League was more than just a sports league – it was the first Black Pride sports movement in history. The cliche goes that those who fail to understand history are doomed to repeat it. Well, here we are in a civil rights movement 2.0, but the problem this time around is that many do not believe that it is necessary. Baruch Spinoza once espoused that “Peace is not the absence of war, it is a virtue, a state of mind, a disposition for benevolence, confidence and justice.” Similarly, equality is not the absence of slavery, it is a virtue…a disposition for justice. It is not an achievement that one can possess, rather it is a struggle that must either be maintained or strived for on a daily basis. Boele van Hensbroek, P. (2012). Cultural citizenship as a normative notion for activist practices. In J.A. Vega & P. Boele van Hensbroek (eds. ), Cultural citizenship in political theory, (pp.77-86). London: Routledge. Iain Fyffe, author of “On His Own Side of the Puck,” has done a better job than I ever could of analyzing the Fosty Brothers’ work in “Black Ice.” Here are links to his extensive review from 2011. His conclusion is that the book has value, but that the reader must wade through and discount the hyperbolic and unsubstantiated claims the authors make in order to get to the matters of historical interest. Black hockey in Nova Scotia has suffered from a lack of study, but as Fyffe, himself a Maritimer, points out, so has the entire history of hockey in the Atlantic provinces. So there still appears to be a need for good scholarship to be done on this subject, as well as on early hockey in the Maritime provinces in general. Awesome! Thanks for sharing (and reading). The article lacks substantiation.One of the major premises that the “Halifax Rules” were influenced by the Colored Hockey League is contradicted by substantiated sources that date the Halifax Rules back to the 1860s, 30 years prior to the existence of the Colored Hockey League. A number of sources note that the Halifax Rules were introduced in Montreal in the early 1870s where they were modified into what became known as the Montreal Rules. It would appear the Colored Hockey League played under the existing Halifax Rules and other than the league allowing goaltenders to cover pucks, it is unknown from the article if the league made any other innovative changes to the rules that were adopted elsewhere later on. For example, it is said the the face off, of dropping the puck to start action, was created in Winnipeg in the late 1890s. I haven’t read the Fosty book to know if it provides any such information. I have no way of knowing from this article what influence the league actually had on the way hockey is played.